I have been having a good time perusing a cookbook lent to me by Anja, our CSA owner. Post-it stickies all over the place, marking recipes I want to try! Fast, Fresh & Green by Susie Middleton is full of easy, unusual twists on old favorites and this beet recipe was one that was a real winner. Easy peasy, which is what you want on these busy summer days. And on a day when the temps had actually not gotten even near 80, I tried these. Simply wash, slice the ends off, slice into 1/8 or slightly bigger slices, toss with some olive oil, a few bits of chopped, fresh thyme, and salt. Lay a piece of parchment paper on a sheet pan and roast beets at 475 for 15-20 min. These are sweet, with a hint of earthiness from the thyme and the high roasting temp. We had ours with a fresh from the garden salad and grilled chicken thighs. The kids have gone back to Montana and are recouping from a VERY long trip home. And I am going thru withdrawal. I miss Trena like crazy, and am already counting the days till we see them at Christmas. I have been a busy reader and can't wait to share some of the goldmines I have found! Love your blog! I'm your newest follower. Have much to explore. Can't wait for the book review. (For my Bday I got my extended family to agree to joining me in a tour of Polyface!) BTW, Your grandbabies are beautiful too! The roasted beets sound delicious with the thyme! I will definitely be trying it when the heat wave is over and I can bear to turn my oven on! I am learning that I love almost my vegetables roasted, even brussel sprouts and green beans! Love that song, and I know how you feel about missing the grandkids...the house seems a bit lonely doesn't it? But Christmas is not so far away. When I first saw that on the little blog roll picture I thought it was a plate of liver! Whew glad to see it was beets! Cute pic and cutie pie lil girlie you've got!! Thanks for stopping by Cyn, your grand daughter is very beautiful! I can't even imagine not living close to mine. That must be hard for you and for them. Praying God's blessings over them until you can be with them again. My garden is slow this year but when my beets are ready I will have to try roasting them. We gets beets in the winter & early spring. I usually dice them and roast them, though if I had a mandolin I'd do it this way. It would make a pretty presentation. Now I have a reasonto grow beets. :) So yummy! A beet has never past my lips! Seriously! I just canned some beets but with the heat they are growin fast and I'll pick some this weekend when cooler temperatures are due and try this recipe. It has me facinate. HAPPY BIRTHDAY TO MY DEAR FRIEND GIVE TO ME BY THE LORD! 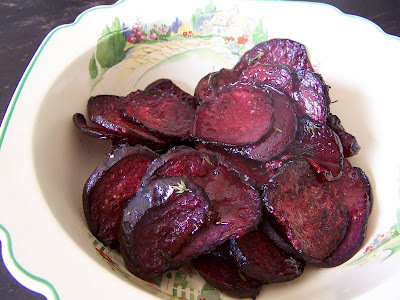 Thanks for sharing the roasted beets idea, I'm going to give it a try with our roast tonight. Your grand daughter is precious! Enjoy her and build lots of memories with her. and i can see why you miss her so. of my life until i met my husband. These beets look amazing. I've never eaten anything but pickled beets, but should give these a try if mine ever begin to grow enough to be big enough to eat. (sigh - winter gardening is slow).